Craftsy has up to 60% off on kits and supplies[ until 9/23. Michaels has lowest prices of the season, Vanna’s Choice $2.50, Caron Cakes $5.00, Caron X Pantone $5.00. 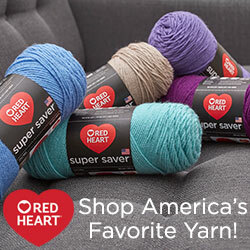 New Affiliate, Hobby Lobby, has all yarn at 30% off this week! At Joann.com, here is a deal for 20% off entire purchase plus $4.99 shipping. Have you noticed my ad for Darn Good Yarns over to the right? I love the philosophy behind this company; they try to do good while selling pretty yarn. 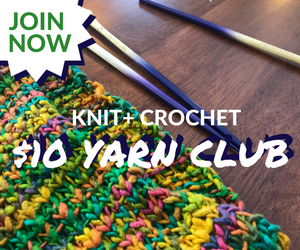 I have great fun each month exploring the Yarn of the Month Club. Only $10 bucks a month for a good cause too. Don’t forget Wool Warehouse and Deramores in the UK but with International Delivery, always something to discover. People are discovering this new affiliate, Consumer Crafts. I think their everyday prices are nice! I’m going to send out this Yarn Deal post every Thurs/Fri. Sign up for blog updates so you don’t miss a post!